Cameroon's Football Federation (Fecafoot) officially launched its search for a new national team coach on Sunday, following the sacking of Volker Finke on 30 October. 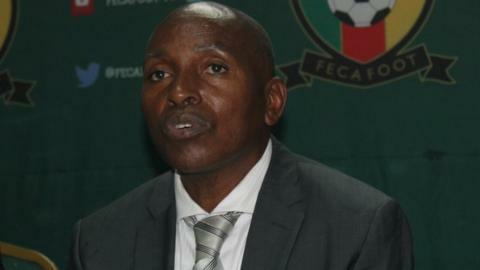 Fecafoot, who placed Alexandre Belinga (pictured) in temporary charge of the Indomitable Lions following Finke's dismissal, advertised for applications on their website. As interim coach, Belinga helped Cameroon reach the next round of 2018 World Cup qualifying, beating Niger 3-0 away and drawing 0-0 at home. Fecafoot says it is open to looking at applications from a foreign coach - not just native Cameroonians - and has given a deadline of 15 December for applications to be submitted. The Federation also outlines an intriguing list of requirements for anyone hoping to become the next Cameroon coach. On a professional level, knowledge of African football is required as well as football coaching certificates and experience in coaching elite football clubs. The advertisement also asks applicants to "have won trophies", speak French and or English and "be willing to permanently reside in Cameroon." Since Finke's sacking, speculation has been rife in Cameroonian and international media about who his replacement may be. 67-year-old Claude Le Roy, who recently resigned from the Congolese national team, is a former Cameroon coach and has previously indicated a desire to end his career with the Indomitable Lions. He is a favourite of Cameroonian legend Roger Milla who is thought to support the idea of having Le Roy back with Cameroon. Another Frenchman, Herve Renard, has also been linked to the job. Renard is available after he was sacked from French club Lille last month. He has a good African football record having won the Africa Cup of Nations with Zambia in 2012 and Ivory Coast in 2015. After the 15 December deadline passes, a Fecafoot committee will scrutinise the applications and then create a shortlist of five from where the new Cameroon coach will be selected.